If you want to take you lunch to school or work then check out this robot lunch box. You can see that the lunch box the front shows a funny robot and gears and next to the robot it will have your name and on the back it even shows your name even bigger. The personalized lunch box comes complete with an icepack, sandwich box, and two snack boxes and all that is machine washable so easy to clean to be ready for tomorrows lunch. 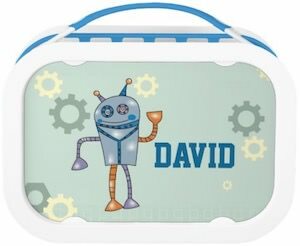 So if you like robots and food then you just have to check out this Personalized Robot Lunch Box. We can all use a cool lunch box and if you like video games then you should check out this Nintendo Mario lunch box. The soft shell lunch box is black with a red handle and on the front, you can see a black and red checkered pattern with in the red squares you will find many Nintendo details. 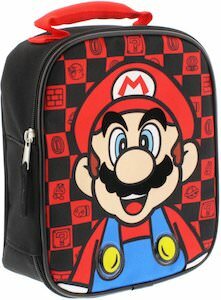 In front of the checkered background, you will find Super Mario and he looks real happy maybe he expect to be fed with the food you store inside this amazing lunch box. So bring your lunch from home to school or work in this fun looking Nintendo Mario Lunch Box. 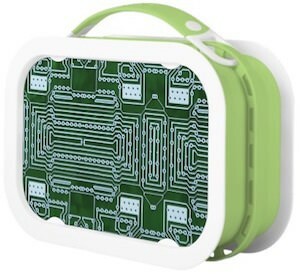 Are you a tech geek in need of a fun useful lunch box? This lunch box from Yubo could be perfect for you. The lunch box is available in different side and handle colors and all have a front and back plate that looks like a circuit board. Inside this geeky looking lunch box you will find and ice pack, sandwich box and two snack boxes and more accessories are available to make this the lunch box you really want. And this lunch box is easy to clean to because everything except the circuit board face plates can go in the dishwasher. Stop buying lunch at work just take you lunch in this Circuit Board Lunch Box. 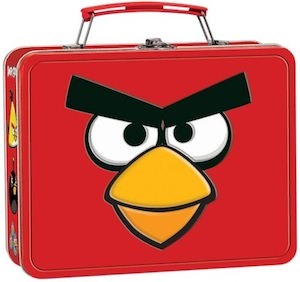 Angry Birds is so popular with the kids that a nice lunch box all themed Angry Birds would be really nice. And now there is one. This metal lunch box is red like Red Bird and even has his face on the front. And to make it more like Angry Birds they put picture of different Angry Birds on the side. This Angry Birds lunch box is great for school and day care but even if you eat lunch at home this Red Bird lunch box is great to play with or to store things in. When you are ready to go back to school then store you lunch in this Angry Birds Lunch Box.